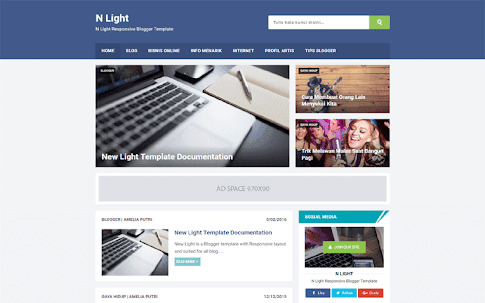 N Light Blogger Template are perfect for personal blog sites, modern and fully responsive (try your browser again), and the light looks cool and sophisticated. You can be happy to run by posts, news, articles, tube videos, photos, links and more. There is a revised version . which I've ever shared the benefits of this model are loading fast on both desktop and mobile devices, and with a simple flat display. It comes with many advanced features. It has a blue color unique design that can be easily changed and you can change your color to your desired color and you can use drag and drop options to create each section depending on your needs. N light responsive and SEO friendly blogspot theme, a revised version of the Light Aggressiv. the advantages of loaded on a fast, desktop or mobile device, and can be accessed with a simple flat display. Built together. This is awesome feature loaded theme.I an suggest to you download this latest version.Because this theme created by me.And our all Thme quality are very good.No any problems for install any theme to your website. Note the all readers:- This templae are Latest by Gourab Design.